Small crossovers are growing in popularity and car makers are falling all over themselves to deliver a robust selection of these little SUV-hatchback-wagons. In essence they are mix of those three categories, offering more cargo room, AWD or 4-wheel-drive capability and hatches for easy cargo carrying and better looks. 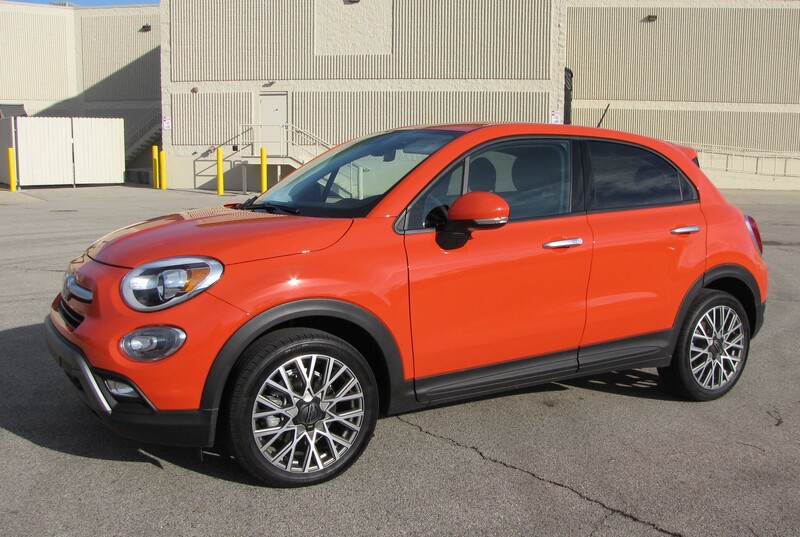 Fiat joins the parade with its 500X using cute styling from its tiny Fiat 500, raising the vehicle some and stretching its wheelbase, just not quite as much as its 500L (as in longer wheelbase), and offering AWD in its various trim levels. 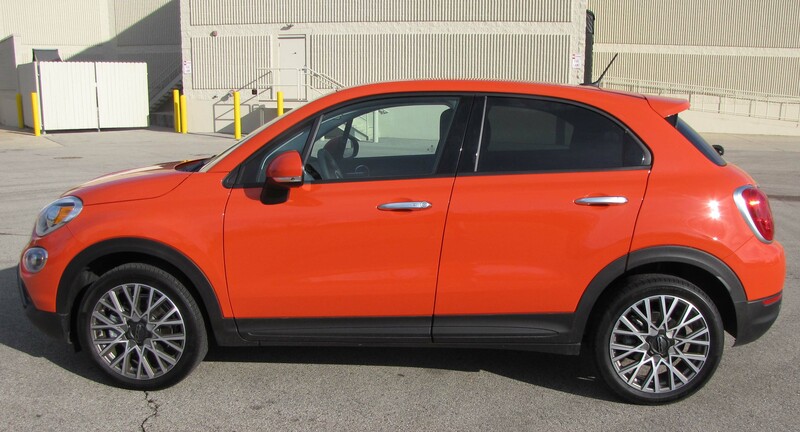 I drove an orange (yes, orange) Fiat 500X Trekking right up through our first snow this winter. The Trekking is up two levels from the base Pop model and starts at $23,200, so is value priced. This one was front-wheel-drive, but as with the other 500X models, comes with Dynamic Control Selector that allows you to engage a traction system, or go sporty when pavement is dry. At this price point, DCS is a rare treat and indeed, using Sport mode allowed the Fiat’s 2.4-liter MultiAir 4-cylinder engine to kick up its heels a bit. The engine makes 180 horsepower with 175 ft.-lbs. of torque, so has plenty of energy to get the slightly less than 3,000-lb. car moving. But Sport mode lets the somewhat unrefined feeling 9-speed automatic transmission shift more quickly, giving the car more kick from a standing start. It also firms the steering for a sportier feel. Probably more important in Wisconsin, the Traction mode reduces wheel spin in wet weather and certainly helped give me better footing in our sloppy wet snow/sleet storm just after Christmas. While the full AWD system would likely be preferable, I had no trouble getting traction in the icy slop on area roads. AWD adds about $1,900 to the price tag. The base model starts at $20,900 including destination charges and the top-end Trekking Plus AWD model lists at $29,900 with delivery. With one helpful option package, the test car clicked the turnstyles at $25,895, a good value compared with some of its competitors. Key ones are small crossovers like the Mazda CX-3, Honda HR-V, MINI Countryman and Nissan Juke. 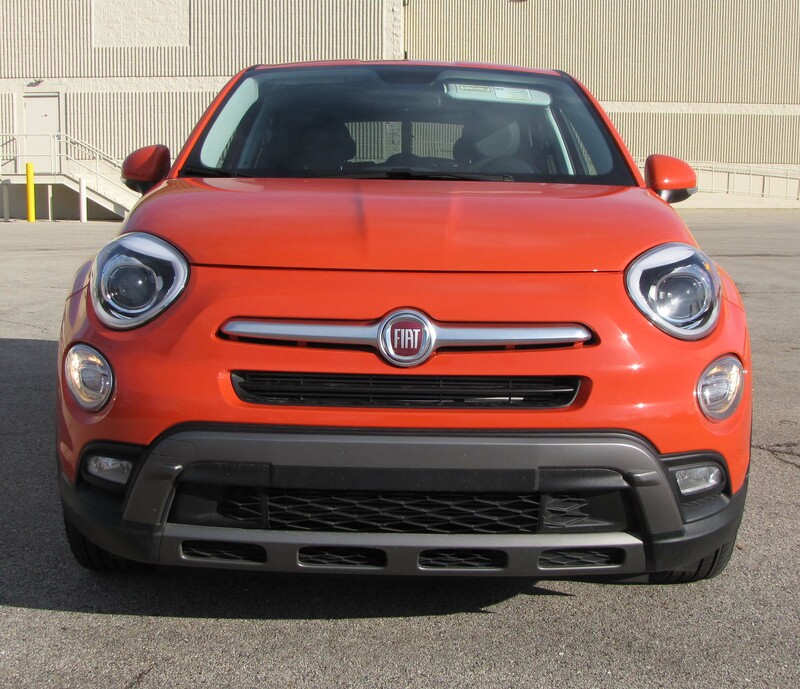 Note too that Jeep’s new Renegade rides on the same platform and features the same engines as the Fiat 500X. The Jeep though has more ground clearance and is designed more for minor off-roading. It also offers a better ride. In fact, ride is the biggest drawback to the Fiat. I didn’t expect that as even Fiat’s tiny original 500 models (90.6-inch wheelbase) ride well as does the 500L model. But ride in the 500X is surprisingly harsh, too stiff and unforgiving. Yet handling is quick and loads of fun, especially in Sport mode. You can zip the 500X around corners at speed or on back roads and it corners well and steering is responsive. Braking is fine too, the Fiat featuring four discs and stability control is standard. Even the interior is relatively quiet for a car of this size and price. In fact, most folks praised the 500X’s interior. Its front seats are particularly well formed and comfortable. The driver’s seat has a pump handle on the side to raise it for us shorter drivers too, a plus. The orange test car’s interior featured a black dash and doors with the seats featuring leather trim but cloth inserts that were attractive and comfortable. Matte silver trim graced the door handles and release levers along with the dash’s center air vents. This is a four-door model so getting into the rear seats is easy enough and headroom is good while legroom is decent if the front seat occupants are not beyond average size. 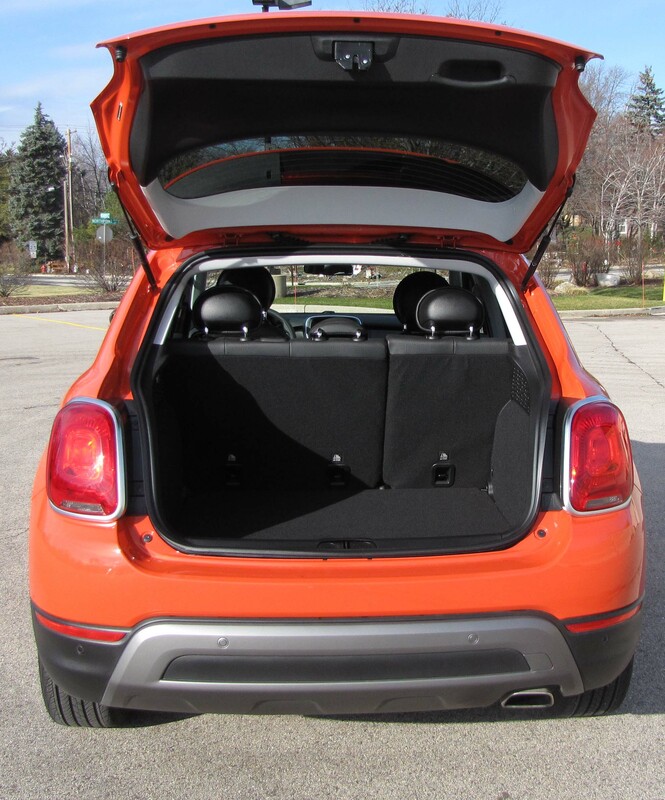 Cargo room behind the rear seats is fair and if you fold the rear seats flat the cargo space grows to 18.5 cubic feet, which is generous. Being a hatchback (including a rear window wiper on the raked rear window), it’s easy to load too. 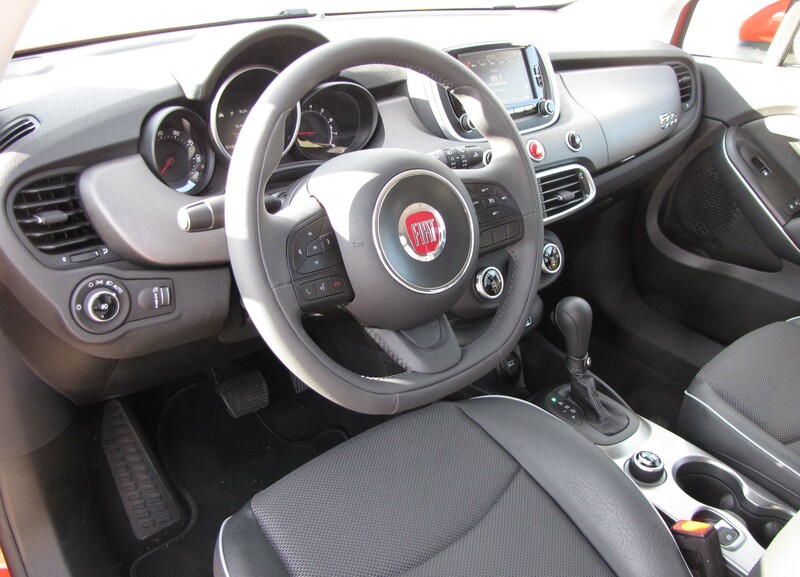 I like the dash layout and gauges as the 500X maintains the youthful look of the Fiat 500 that debuted a few years ago. The test car had a fairly large touchscreen, 6.4 inches, which was part of a $1,700 option package. The screen was easy to use and see and below that are three large climate control knobs that are simple to use. 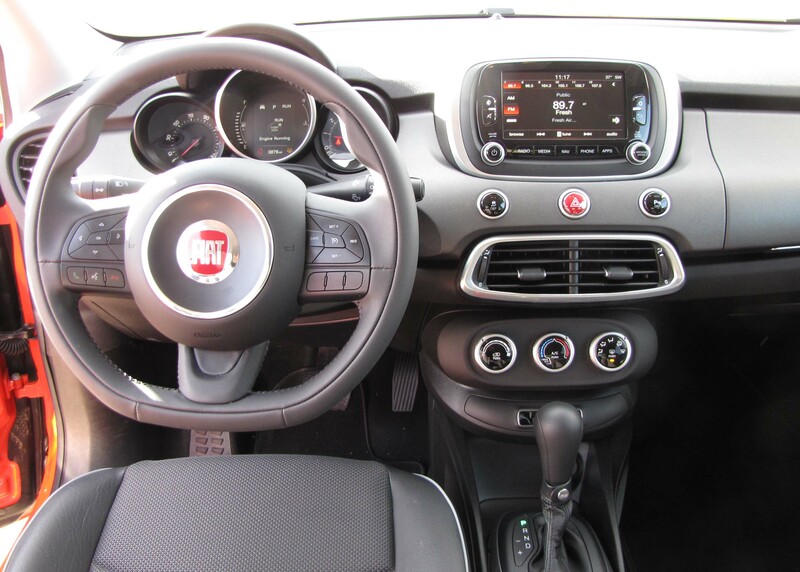 Fiat also provides a tilt/telescope steering wheel too, but no matter how I adjusted it, the wheel partially blocked my view of the main dash gauges. The A pillar also is large, as in so many vehicles these days, and that creates a bit of a blind spot. Luckily there is a bit of space between the side mirrors and the roof pillar to lessen the blockage. One other bugaboo that became apparent once our weather turned icy. The rear defroster kicked off automatically after 10-15 minutes instead of waiting for the driver to turn it off. Your first warning is the rear hatch window beginning to re-fog midway to work. While the bare bones Pop model comes with fewer of the goodies we all expect in today’s cars, the Trekking model upgrades to 17-inch tires, adds cornering fog lights and automatic lights, upgrades to a digital cluster of gauges and adds satin chrome trim on the exterior. The test car added Package 27G for $1,700 and it included blind-spot warning and cross traffic detection system, 18-inch tires and aluminum wheels, the larger touchscreen with HD radio, GPS and both ParkSense and ParkView systems, the later being a rear backup camera. The Uconnect infotainment system also is part of the deal and other minor upgrades. A few other pluses here include push-button start, sun visors that slide and include extenders and spiffy “500” logo stitched into seat backs. Gas mileage was decent here, but not as good as the Mazda CX-3 and Honda HR-V I’d driven earlier. I got 26.1 mpg while the EPA estimates this model will get 22 mpg city and 31 mpg highway. My driving was a fairly even mix and did include one day in sloppy snowy conditions. 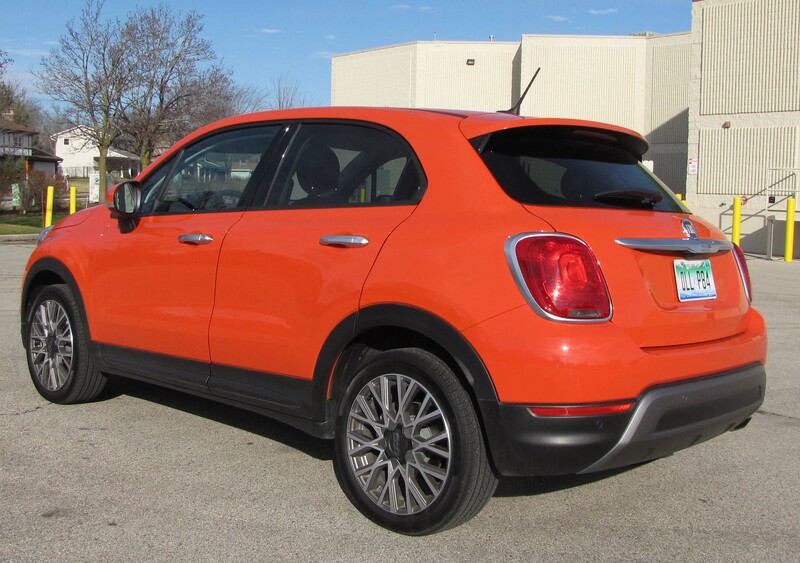 If a stylish fun-to-drive crossover with decent gas mileage is your goal, the Fiat should be considered. If comfort and better fuel economy is vital to you, there are several other good choices. Hits: Compact and fun to drive, good handling, sport setting provides more power and traction setting reduces wheel spin. Quiet interior, well-formed seats, big climate control knobs, rear hatch and wiper. Value priced. Misses: Surprisingly harsh ride, a big A pillar creates a blind spot, rear defroster turns off after 10-15 minutes, tilt/telescope wheel partially blocks gauges.